Wilton Hospital for Animals was established in 1962. We are a member of the American Animal Hospital Association. We serve dogs, cats, ferrets, rabbits and other “pocket pets”. Our ultimate goal is to maximize your pet’s potential for a long and happy life by delivering exceptional veterinary care in a warm and personal environment. 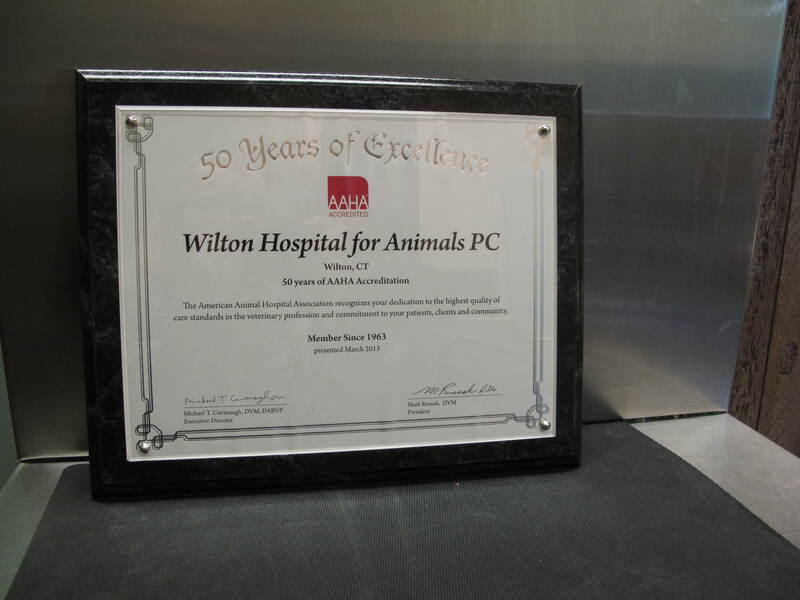 In recognition of 50 years of continued service to the community, Wilton Hospital for Animals was given a certificate of recognition by the American Animal Hospital Association. Having grown up on a farm in rural Indiana, I have always been comfortable around all animals. Fortunately, during professional school, I found that I wanted to be directed towards medicine science rather than animal husbandry. I therefore applied to Angel Memorial Animals Hospital in Boston and was one of 6 candidates nation-wide to be accepted for an internship. This cemented my dedication to providing the best evidence-based treatments. Upon completion of the internship, I contacted Dr. Peter Olson who was also an Angel Memorial graduate. 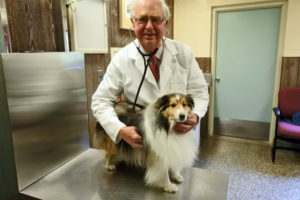 I joined his practice October 1, 1967 knowing that it was a great community in which people took pride in their animals and wanted the best medical and surgical techniques available. Dr. Olson’s father was a pioneering veterinary surgeon in Canada. My influence concentrated on constantly improving the support and care of the animals. I was directly involved with the formation of Animals in Distress, which is still a vital organization. Wilton Hospital for Animals is a member of the American Animal Hospital Association which has rigorous standards of excellence to the extent that only a few hospitals nation-wide enjoy the recognition. Over the years, I have become more aware of the animal aging process as it pertains to the animal’s changing life styles. These changes necessitate adjusting treatments for these senior animals. These assessments are based on actual observations and not strictly monitoring changing chemistry values. In the past 50 years, there have been tremendous advances in medicines and adaptability of supporting technology, i.e., digital X-rays, computer software for more complete record keeping, etc. The digital records provide a paper-less practice which allows the doctor to quickly review a patient’s history and better monitor the needed changes in treatment. 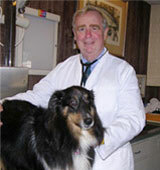 This has been a very exciting and stimulating 50 years to be a veterinarian. I look forward to continuing changes and my continued role in the animal community. We are a warm, friendly, competent and attentive support staff. Services Offered: Wilton Hospital for Animals is a progressive, well-rounded practice offering you and your pets a wide variety of services.